Home » Appetizers » Cassarino’s Vegetable Stuffed Mushrooms – these are a light and healthy appetizer everyone will love. Cassarino’s Vegetable Stuffed Mushrooms – these are a light and healthy appetizer everyone will love. 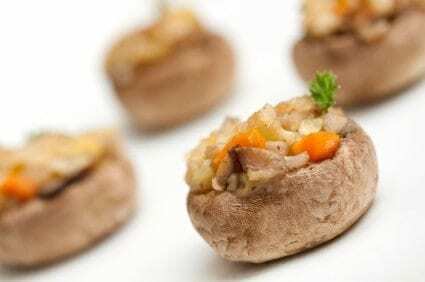 Vegetable stuffed mushrooms are wonderful for a party, you can make these ahead of time, or they are even wonderful during the summer when you want a light dinner. Finely chop vegetables and mince the garlic cloves.Heat margarine in a saucepan. As it begins to soften and melt, add the vegetables and garlic, cooking until soft. Add the Marsala wine, and finely chopped parsley. Allow vegetables to cool. Add mayonnaise and seasonings. Mix in Ritz crackers, crushing them as you go.Stuffing should be firm and hold itself together. If still loose, add some breadcrumbs.Stuff caps and bake in 350F oven in a greased pan for 25 minutes or until the base of the mushroom is soft. These are so good! I made them for a family gathering and everyone loved them!